Written and presented by Shannon Litzenberger, with consultation and support from Andrea Nann, Soraya Peerbaye and Helen Yung. It’s been my sincere pleasure to enter into the Whole Shebang process over the past several months as a kind of outside observer. I’ve spent time becoming acquainted with your process and experiences by taking in the creative artifacts that you have produced along the way. I’ve been harvesting, through my own artistic lens, the insights that have emerged from your individual and collective journeys in order to offer back to you an interpretation of your collective experience. I have to say, it has been a great gift to peer through the window of your work together, and to see what has emerged as a result of your investment in The Whole Shebang process over time. Your courage and commitment have been inspiring. In accepting the task of offering some culminating thoughts on the Shebang Process today, I spent time witnessing and finding connections among your experiences across four distinct communities along this 4-year journey. Some of the sentiments and feedback expressed through the process really stuck with me as I absorbed the moments of reflection, exploration, discomfort, disruption, discovery, and transformation that you experienced. One of the themes that have emerged for me is around presence, perception and the body. Another theme was one of creating trust, connection and belonging. The third theme was about entering the unknown and traveling beyond the limits of your comfort. These themes really resonate for me as dancer, choreographer and creative facilitator. Through the evolution of my own artistic practice over the past 15 years, I’ve come to value my role in facilitating community connection through movement-based practice. Exploring movement helps us feel alive and well in our own bodies. I believe this kind of physical exploration can help us cultivate focus, connection, empathy and trust. When we embody these attributes, we are better able to collaborate, take risks, explore new territory, traverse new thresholds and create. The insights I’ve accumulated through my own embodied practice has led me most recently to begin developing a movement- based leadership practice for corporate teams. This practice, that I call ‘Embodied Leadership’ uses mostly non-verbal movement-based process to help teams develop focus, awareness, empathy and trust in order to take risks and co-create more effectively. This kind of physically-rooted, interactive and experiential learning has been a welcome counterpoint to the static consumption of information that is so prevalent as a form of learning and development in the corporate world. Cultivating our ability to create, as it turns out, is not just a fundamental skill for professional artists, but a useful human pursuit. Its application resonates broadly in life and work. Andrea’s vision for The Whole Shebang was to celebrate the coming together of artists from diverse backgrounds and practices. Its first iteration in Toronto in 2004 brought together some of Canada’s most outstanding talent in the areas of dance, music, literary arts and film. The multi-disciplinary evening she presented paid tribute to the carefully honed poetry of each creator in the language of their own artistic medium, while also creating a space for exchange and collaboration across forms of practice. The early artistic exchanges generated from the original Shebang revealed the distinct strategies and tools that artists from different disciplines were using to create. Andrea says that she’s always been greatly inspired by the way other artists talk about their work, by the way the processes they engage in help move them through some of the challenging thresholds we all face as creators. Through the lens of other creative practices, it became clear to Andrea how the self-awareness and heightened consciousness that dancers work with is very unique to dance. Her curiosity about how creative process tools could be translatable and transferable across art forms has driven her desire to bring artists together across form, practice and community. Through many inspired iterations of The Whole Shebang over the past 12 years, she has been building bridges between creative communities in order to develop common understanding across distinct artistic languages and ways of creating. The Shebang process that you’ve all been a part of was born out of this original intention of The Whole Shebang – a process of convergence, exchange, learning and congregation between people and artistic communities. The Shebang Process is a collaborative process based in practices of the body, movement and dance that deepens and broadens artists’ perceptions, creative possibilities, and their ability to be present both in the creative act and in everyday life. The “ripple effect” that this process catalyzed was felt across individual artistic practices and interactions, and also within communities – with neighbours, students, family and friends. The process enabled the generation of common ideas in order to learn, exchange and create together in an environment of trust, receptivity and responsiveness. The process invited all of you to strengthen your connection to each other and to your shared sense of community. In reflecting on the expressions of your experience, I was compelled to ask the question – What is community? And how is it actually created or strengthened? A community is not easy to define. It is, in essence, a sociological construct. It can’t be seen, or touched. A community is not human but it does not exist without its humans. It is made up of much more than just the people who are in it. It also contains a set of relationships, interactions and behaviours that have meaning and expectations among its members. It may or may not have a physical location. In fact, the boundaries of communities are not precise. Communities can be defined by a shared interest or passion; they can be defined by action or a desire to bring about change. They can be defined by geographic boundaries, or by a profession – a community of practice. Or they can emerge from circumstance – brought together by external events or situations. Community is sometimes defined as a unified body of individuals, people with common interests, or an interacting population of various kinds of individuals in a common location. When we look a little deeper into the origins of the word community, we combine the Greek ‘com’ – to come together, and ‘munis’- to fortify, or to strengthen. At its roots, ‘community’ is not a concept, it’s an action. To create community is to bring this action into existence. A unified body of people bringing a collective action into existence. Dimensions of community include the economic, political, technological, aesthetic and conceptual. The culture of a community is transmitted through symbols, learned ideas and behaviours. How are communities consciously or unconsciously transmitting the symbols, ideas and behaviours that define them? Children become versed in their community systems and dynamics through play. Even as adults, play is a powerful mechanism by which we explore the politics and non-verbal meaning of interactions between individuals within a community. Communities are cultural organisms that are constantly negotiating a shifting set of relationships, attitudes and behaviours among their members. Given their nature, it seems fitting that a community’s cultural leaders – namely its artists – should play a role as stewards and mobilizers of a community’s evolving identity and relationship dynamics. Andrea, I would surmise, is a not only a creator of community but also a community mobilizer. She has set communities in motion quite literally through the Shebang process, with the intention that the concentrated energy of this initial movement would emanate beyond its points of origin in Guelph, Kingston, Niagara and here in Burlington. The Shebang process offered a frame for you and your communities to come together in new ways, to explore, to connect, to create, to challenge, to exchange, to grow and to share your experience out into the world. Its success is proof that local citizens and artists can work together to address community challenges and make positive change. My attempt to translate your expressions through the lens of my own experience is not intended as a summary. It can perhaps be thought of as another ripple in the water. An attempt to illuminate the intersections of experience across your distinct communities. Many of you shared insights about how your relationship to your own physical selves evolved or changed. Tuning into the body through sensory activation seemed to open channels for connection and possibility. Shifting our attention into the body allows us to be more present and in that presence, to perceive ourselves, each other and our environment as they are, without judgment. The Shebang has opened me up to think in a new way. When my thoughts released, I could perceive a wider field of activities around me. Don’t question or critique. Observe and do. Through the bodywork, I came to understand a more holistic way to feed myself as a creative person. It has helped me to deepen a sense of what I am experiencing and feeling in my body. I have reconnected with a sense of play. Tuning into our own bodies allowed us to also tune into each other. Shebang has given me permission to relax. Shebang forces me to listen to others, to follow my intuition, to slow down and simply engage with the activity in the moment. Dance as the way in to creating was very exciting. As a result of Shebang, I learned how much I love moving. I think that dancing and moving the body is something that everyone should do daily. It makes the whole world clearer. For me, I think the biggest effect will be to be able to make coffee for my husband on the morning of a big event. I want to have presence in all I do. So much creativity depends on a wellspring of aliveness. The Shebang is an invitation to be human – to play, to study, to exchange; it is permission to move in and move on. It is permission to pursue your truth. Another theme that emerged in your reflections is one of creating trust, connection and belonging. These are the conditions for taking risks, for discovery, for achieving the extraordinary. Our sense of safety with one another gives us courage to advance into new territory, to experience intimacy, to allow ourselves to be vulnerable. We negotiate giving and receiving in order to care and be cared for as we express ourselves authentically as individuals. When this feeling of belonging is affirmed, we feel at home. This home is not just a place but a community where our unique voices and perspectives can co-exist in compassionate company. It is equally a place where our collective identity finds an expression that transcends its individual parts. The Whole Shebang process helps us accept others where they are and as they are. I’m more actively interested in what happens when people come together and input is allowed from everyone. The Shebang gave us a rallying point around which to create art. We have learned to respect each other and to be non-judgmental with ourselves. There has to be give and take – it’s hard letting go of ideas. To be able to stretch, to challenge ourselves and grow in such an accepting environment is very special. The Shebang has revealed the importance of creating space and trust within a group. Over the course of our time together, there is more trust; people are less apprehensive to share ideas, compared to when we started. Our group mind has become stronger and we have been able to work together, better, all of the time. Our ability to communicate and express ourselves has evolved. We can all speak candidly with each other. I trust everybody around me. It felt like the group just belonged together. The Shebang process taught me to trust and contact and connect at a deeper level with fellow artists and with myself. It was intense, exhausting and exhilarating and full of courageous and generous artists who were willing to be vulnerable with each other. The games we played are a command to put down your devices and communicate and to be together collectively. I left feeling a deeper connection to the city, the Shebang artists and the warm community that surrounds them. This community empowers me to explore more. These are my people. The Shebang community is my people. To enter the unknown is to commit fully to becoming. To let go of control. To abandon expectations. To engage your courage. To push beyond the limits of your comfort. To venture toward new territory. To accept whatever will be. To remain detached from the outcome in favour of a great, rich and deep commitment to exploration and discovery. To be ecstatically prepared for nothing, stepping out onto the road not yet traveled. The Shebang process gets you doing things that get you out of your comfort zone. We are getting ready for nothing. We are ecstatically prepared. We are moving in one direction to be able to expand into another. What possibilities can emerge when allowing takes place? I am full of ideas. I am letting them become. I am in the flow of things. Not everything has to have meaning. I learned to be comfortable with ambiguity. And for the next hour or ten, we don’t really know, we are stuck in awe, in the light of possibility, struck by each other, struck by the space, struck by the vision. It has been at times illusive, and often illuminating, it has expanded my willingness to try new and different things. The act of creation is mysterious. The more you try to speak about it or pin it down, the more elusive it becomes. You might not be where you planned to be but you are where you’re meant to be. To value the role of the artist in our communities is to acknowledge that artists can contribute uniquely to our health and wellbeing and to our shared quality of life. Artists can illuminate truth, offer transcendent experience in a far too literal world, challenge us to feel, and connect us to our common humanity. Almost every community has artists. Often, though, this readily available resource is untapped and underdeveloped. Communities need better tools to help them find and collaborate with artists, while artists need not just an invitation but a charge to engage with their communities, as you have. The practice of embodied moving, knowing and learning ripples out into our lives after the Shebang. As the energy of the Shebang Process emanates outward into the world, we start to see how creative practice spills over into life. Together, we are expanding, creating, healing, strengthening and becoming more resilient. A group of near-strangers came together with little to no idea of what was in store for them. Three years later, this group has formed into a community unto itself, comfortably moving together, united by themes as varied as the people themselves. The empathy, friendships and possibilities that Andrea invited and encouraged in the last two years amongst different folks with different passions and creative gifts will continue to ripple in our community in surprising and transformational ways. Openness and sharing between artists and supporters is one of the most impactful, mercurial “ripple effects” of the Shebang Process. Cultivating peace, understanding and finding common ground for a community through the arts is how the world changes to be a better place for all. The impact was huge for our city. It will now have an arts cluster that will help generate ideas and creativity in the community. All ripples begin from a source. For the last four years, Andrea has been your source, the original stone dropped in the water. I’d like to invite Trevor Copp to share some of the ripples on behalf of many of the artists involved. Because of the Shebang experience I, Adam Buller connected to everyone involved and further expanded my general open mindedness and understanding for other artists approaches and mediums. What once might have been strange and unapproachable became less alien and even identifiable in a personal way. Although no plans have been made thus far, such respect, admiration and friendship has been solidified with my particular group of Shebang’ers, I’m excited and hopeful that future collaborations will be spawn from this. And finally, appreciated at a whole new level what an amazing community I live in that celebrates the arts in so many ways that it is hard to even document~!!!! Because of the Shebang experience, I, Bry Webb connected to my body in performance and we are very happy together. Shannon connected to Lisa and they are collaborators, Form CDT board members, and friends. Because of the Shebang experience I, Kyoko Ogoda connected to my soul and close ones and we are now talking bluntly more. Because of the Shebang experience, Lisa Pijuan-Nomura connected to Brendan Wyatt and they danced together to the ukulele tunes and smiled all the way through knowing that they are soul connected. Because of the Shebang experience, Lisa Pijuan-Nomura connected to Richard and they made sweet art and deep memories together. Because of the Shebang experience, Liz connected to each and every person in the Burlington Shebang in a completely unexpected way. Because of the Shebang experience, Megan English connected to artists in her community and is inspired to collaborate and manifest a project that has been in her head for some time. Because of the Shebang experience I, Sara connected to Andrea and I will forever hold a dear place in my heart for her warm, kind and creative force. Because of the Shebang experience, Eve connected to a new community, new friends, and a new way of seeing these both through art and expression and this has confirmed her interest and passion in arts administration and also art creation. Because of the Shebang experience, I [Bridget] connected to a group of diverse and creative individuals in Burlington whom I might not have met otherwise and we are now friends and colleagues. Because of my (Terry’s) involvement in the Whole Shebang experience at the JK Tett Centre in Kingston, I have started to play violin again and I’m in a small Ukrainian band and we did 9 shows at Lviv Ukrainian Folklore festival last weekend. Because of the Shebang experience I, Martee Tegtmeyer connected to the Tett Centre for Learning and Creativity community) and we are planning co-healing wellbeing initiatives. Because of the Shebang experience, Lisa Emmons connected to Shannon Kitchings and we worked together to get Form CDT not-for-profit status. Because of the Shebang experience I, Lisa Emmons connected to The Burlington Performing Arts Centre and we (Form CDT) became part of their dance series in 2017. 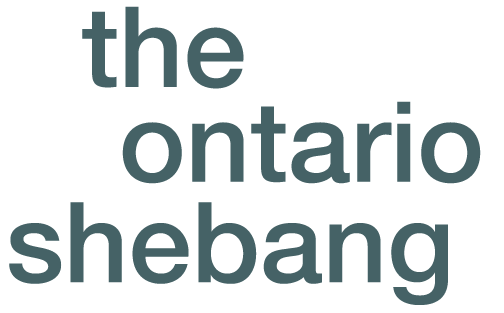 Because of the Shebang experience, Lisa Emmons received her first OAC grant for Reflective/Vulnerable and Form CDT was able to collaborate with The Whole Shebang Burlington to share Through The Eyes of the Machine. Because of the Shebang experience, Lisa Emmons was able to premiere her new work co-created with Mayumi Lashbrook at The Whole Shebang Burlington Performance on June 4th. Because of the Shebang experience, Harry Symons reconnected to Ebon, Chantal and Irina while trying to do likewise with Terry, Dorothy and the rest of the Kingston Shebang cohorts as they walked through the exhibition “Cricket, Corrosion and Cafeterias – Continuing Confounding Conundrums” while embracing something of the creative spirit of the Tett Centre, possibly even the experimental nature of the State of Flux, and talked about how these expanding clusters of paintings could indeed be seen as extending the creative ripple that was started in The Kingston Whole Shebang, (an event in which time and space were readily and repeatedly reimagined), with some declaring categorically that the small exploratory efforts by Harry to extend the exhibition even further, beyond the confines of the gallery to other locations within the Tett, (and even a few other locations around Kingston), was just a confirmation that the Shebang creative ripple is still expanding, all of which left everyone to imagine what kind of manifestation it might take on next.